Grow and develop your skills in web development, user experience design, digital marketing, data science and more with the expert guidance of General Assembly. With over 50,000 course graduates under their belt, General Assembly is a trusted quality education provider, offering students an innovative learning experience with courses specifically designed to meet employer needs and market demands. Be part of a supportive community during every step of your learning journey and beyond! 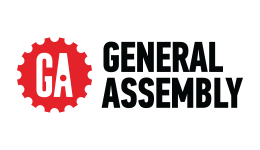 General Assembly cares about your future and wants to help drive your career forward, which is why they developed an Immersive program to help you grow the right tools and strategies when it comes time to head into the workforce. You’ll also have access to GA’s huge network of over 50,000 alumni as well as the opportunity to attend exclusive events. This qualification will enable you to demonstrate skills, abilities and experience in the in-demand field of data science, and may enable you to pursue new employment in a role relating to data, strategy and decision-making. This qualification will enable you to demonstrate skills in data visualisation and analysis, to help business leaders make difficult, risky and game-changing decisions.